Here is a link to an hour-long lecture in which Austrian scholar Jörg Guido Hülsmann logically explains why modern fiat-money systems create a culture of war and materialism, and make upward economic mobility difficult for the poor. Dry delivery; devastating content. It provides an insightful overview into the decidedly Neptunian effects of Age-of-Pisces monetary systems which promise stability and deliver dissolution and corruption. Here's his chart (no birth time publicly available) and a short analysis accounting for his sociopolitical and economic views. Libertarian: Pallas ruled by Mars which is conjunct Sun, North Node, and Mercury. 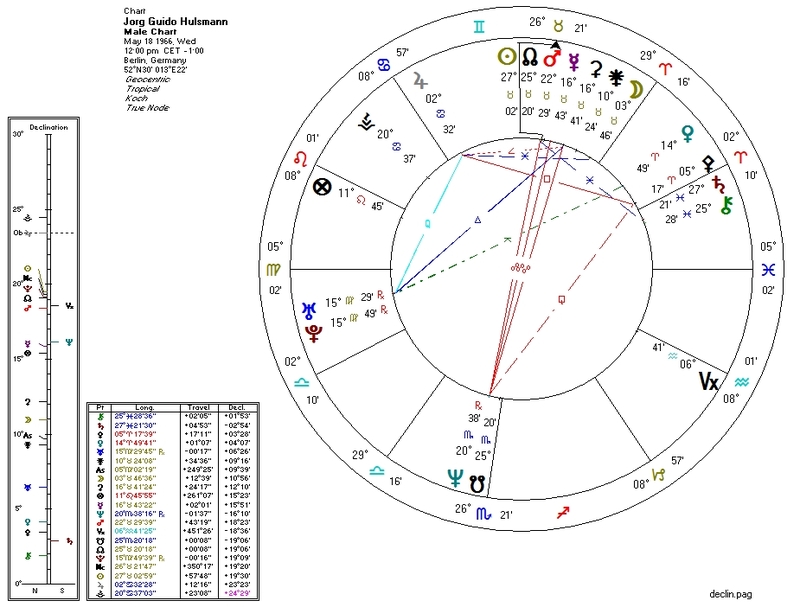 A square from Jupiter to Pallas is usually enough to knock a chart off the libertarian position, but we have the full trifecta of Pallas-supporting factors conjunct the ruler of Pallas. The chart is, despite Jupiter, extremely libertarian. Capitalist: Venus ruled by Mars which is conjunct the North Node. Collectivist: Mars, ruling Venus, is opposite Neptune. But Neptune is conjunct the South Node, draining his power. Overall, we have a chart that tends very strongly towards capitalism, especially over time.